First visited November 2008. Last visited on November 25th 2010. Hwang-So Sauna is misleading because the establishment is a jjimjilbang which of course means it has an adjacent bathhouse (목욕탕). As yet, I haven’t visited the jjimjilbang and so this review is primarily concerned with the bathhouse (목욕탕). This bathhouse is impeccably clean and modern and the only reason I prefer Migwang is I find the low ceiling in the changing area claustrophobic. Being 1.95cm tall, my head almost touches the ceiling and the changing area by the lockers lack poofes or benches. The actual relaxation area (휴게실) is more comfortable with a normal ceiling and sofas, television a barbers and shoe shine. The bathhouse (목욕탕) is on the small side with low-level lighting due to the black marble walls. I like the floor as it is a rough texture and unlike many bathhouses, slipping isn’t such a hazard. 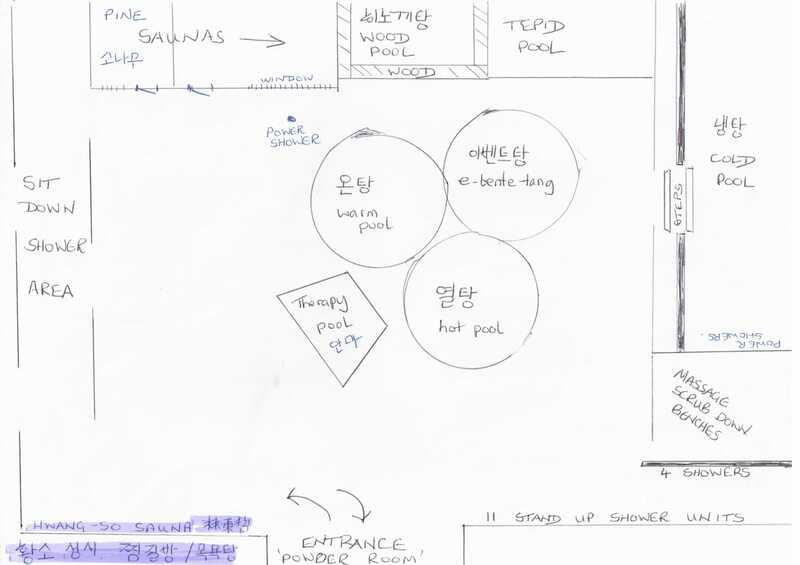 The central features are three circular pools, a warm pool, (온탕), hot pool (열탕) and a the ever-present e-bente-tang (이벤트탕). Over the three pools, and matching them in size are enormous circular, low output lights. Beside the three circular pools is a therapy pool. At one end is a large cold pool (냉탕) which is accessed by steps which take you up and into the pool without having to clamber. This is the best designed cold pool I have seen and the steps give it a ‘regal’ appeal and very much make the head of the bathhouse a significant feature. Personally, I like a colder pool in summer. On the far side of the bathhouse as you enter, are various sauna which I have yet to explore and to the right of these, a traditional wooden pool (히노끼탕), and a tepid, shallow pool. The wooden bath temperature was 36 degrees. The temperature of the other pools was mid range, (the gauges weren’t working) with no pool being very warm or very cold. The e-bente-tang (이벤트탕) contained coloured water, on this occasion red which made it look like a Ribena bath. The therapy pool was very strange and indeed more of an ‘event’ that the e-bente-tang. The jets of water that were supposed to massage your back were quite weak but the pool made the strangest rumbling noise that resonated in your stomach and made you feel on the verge of releasing an enormous fart. Whether or not this was its purpose or it was just noisy, I am unsure. The atmosphere of the bathhouse was intimate and I like the subdued lighting. However, I have visited this pool when it has been busy and found it too intimate, personally I prefer a larger complex but on my last visit, a weekday morning, there were only three ‘bathers’ and I really enjoyed it. 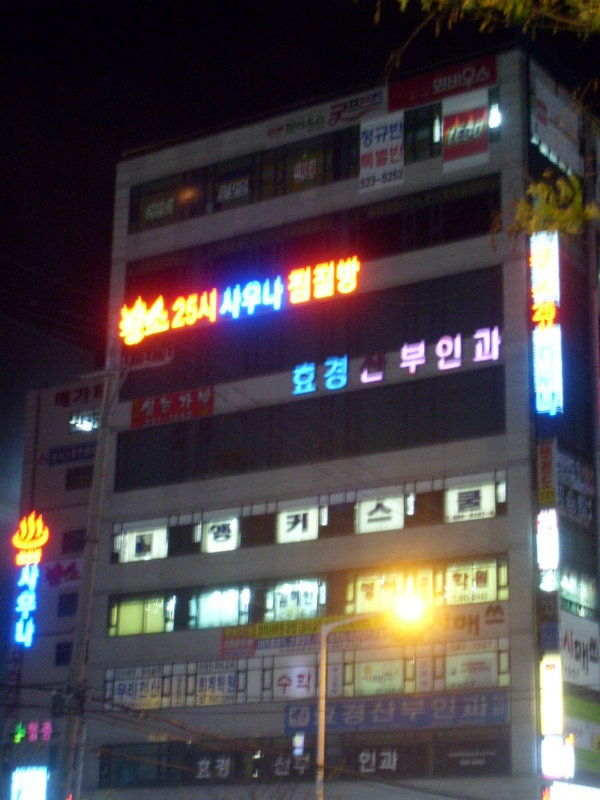 Times – 24 hour jjimjilbang and bathhouse. Cost – bathhouse 5000 Won, jjimjilbang – . Monthly all-inclusive -. Others – Parking. Mega Town complex has numerous restaurants and a large seafood buffet restaurant. There is also the cinema and various sports clubs. Very close to E-Marte and Keimyung University )20 minute walk). Ambiance – relaxing, and intimate though a little small. Black marble, very clean, very comfortable. Waygukin – Didn’t see any but I don’t frequent here on a regular basis. © 林東哲 2010. This work is licenced under a Creative Commons Licence. Ray, thanks for you comments. I hope you enjoy the experience! I really enjoyed my visit to this bathhouse. It has a sort of ‘gentlemans club’ feel to it. My visit was late on a saturday afternoon and there were no children at all. Also, there is no TV in the main room which gives the place a very relaxing and quiet feel. However, it is very intimate and I don’t think I would enjoy it on a busy day. I particularly liked the steam room and the wooden pool. Highly recommended!